Julian Myers (1918 – 2014) was a revered and much-honored fixture in the Golden Era of Hollywood for his work as a publicist for glamorous Big Screen movie stars, Marilyn Monroe, Julie Andrews, Elizabeth Taylor, Richard Burton and Bette Davis. He went on to become a respected professor, teaching Public Relations at Loyola Marymount University, School of Film and Television, where we first met. He served as my mentor for several years. Julian was a huge admirer of Edward Hopper’s work. 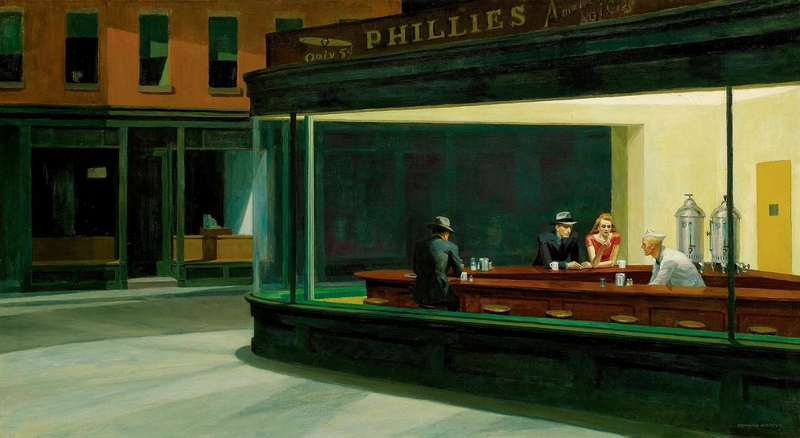 “Nighthawks” was by far his favorite as it is to many others. Julian had an idea that this unusual cast of characters; a counter man, a couple at the end of the counter and a single man by himself was perfect for a short story about their lives. One thing Julian wanted to do was to produce this movie and he nearly accomplished it. I say nearly because, he passed away before we were able to finalize a movie deal we had on the table. In August of 2007, Julian proposed that I write the script to his specifications. He wanted the story to be told as a 90 minute short film on one set, perhaps a sound stage, near Los Angeles. Of course the set would be built to appear exactly as the painting, taking place in Greenwich Village. I was thrilled that Julian considered my skills good enough to write his script for him but that was a really tall order. Eventually, we negotiated and he agreed to let me do it on two sets so that I could have both the restaurant as it is depicted in the painting and my second set would be an apartment complex across the street where my fictional characters would reside. Together we worked on our story of true love, surviving marital conflict, the agony of separation, women in the workplace and racial discrimination. This was a time of great life-style changes throughout America and the world. Actually, it took three years to write a solid first draft. Another friend worked up a film budget for us in July of 2010 to the tune of over one million dollars. From the beginning Julian wanted something on a much smaller scale but we pressed on and by 2012 Julian was off and running literally advertising our soon to be produced movie. Both Julian and his wife were dear friends. Julian’s wife Patsy passed away a few months before he did and I believe their’s was a true love story; I will miss and remember them both.